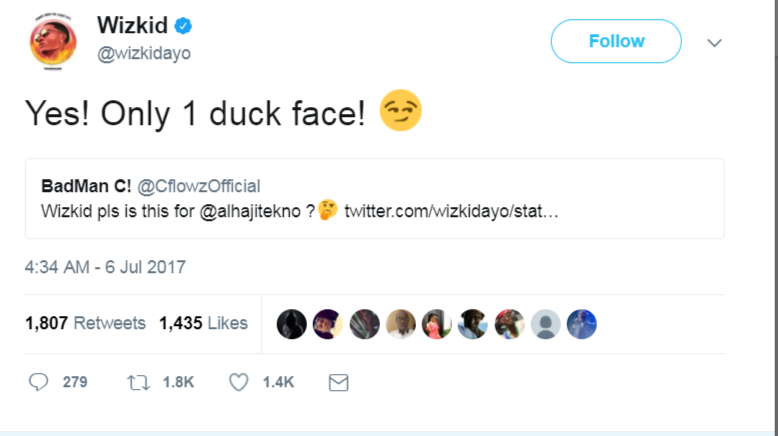 Wizkid calls tekno a duck face. Music star, Wizkid has replied Tekno, who decided to 'buy' a fight he did not know anything about. Nah only Tekno waka come. Tekno has bought a fight that appears to be too hot for him to handle, after he stepped into the Twitter ring with Wizkid. The Pana singer went after Wizkid, who had previously dragged Davido on Twitter for dissing him on Olamide’s song ‘Summer Body’. In view of this, starboy Wizkid decided to put him in his place, washing him down before calling him ‘duck face’. Davido and Wizkid had been having a go at each other lately with the latter calling the former ‘frog voice', and Tekno, who probably felt he was not getting any attention to himself, decided to wade in by throwing shade at Wizkid. "Good morning! Ducks don't play where lions play! *wink emoji* Enjoy your day my people! ", to which Tekno replied asking an unnamed artiste to go for a HIV test.